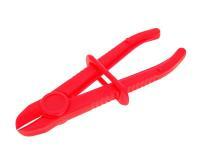 This set of pliers is a simple solution to stopping oil, fuel or coolant from leaking when carrying out repairs. Clamps down on the hose and seals it long-term. Leaks are a thing of the past. For hose sizes up to a diameter of 20mm.